Toulouse is a city in southwest France on the banks of the River Garonne, 590 km away from Paris and half-way between the Atlantic Ocean and the Mediterranean Sea. With 1,102,882 inhabitants as of Jan. 1, 2006, the Toulouse metropolitan area is the fifth-largest in France. Toulouse is the home base of the European aerospace industry, with the headquarters of Airbus, Galileo positioning system, the SPOT satellite system, and CNES's Toulouse Space Centre (CST), the largest space center in Europe. Thales Alenia Space, Europe's largest satellite manufacturer, and EADS Astrium Satellites, EADS's satellite system subsidiary, also have a significant presence in Toulouse. Its world renowned university is one of the oldest in Europe (founded in 1229) and, with more than 97,000 students, is with Lille the third-largest university campus of France after Paris and Lyon. 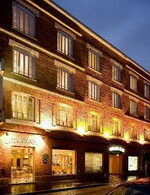 Comfort Hotel Le Clocher de Rodez in Toulouse is set in an eighteenth-century building in the centre of the city. The property is within walking distance of the main tourist attractions and four kilometres from the airport. 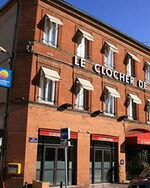 Business guests of the Le Clocher de Rodez can hire the Toulouse style, red-brick conference room for small meetings and can gather after work in Le Bar a Bieres - a speciality beer bar. Multilingual staff at the 24-hour desk can provide sightseeing assistance; while weary travellers can unwind to laid-back lounge music on the cafe's leather couches or play a game of cards. 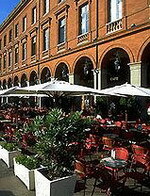 The hotel also offers a cafe terrace, a popular spot for light lunches and weekend breakfast buffets. Nearby attractions include the famous shopping street of Alsace-Lorraine, which is only 90 metres away; and the historical Place Capitole, which is 500 metres away. 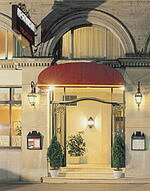 The charming Grand Hotel Raymond IV is located in the centre of the historical district of Toulouse, France. Attractions like Capitole Square and the Saint Etiennes Cathedral are nearby. The hotel is also close to transport links like the airport shuttle bus terminal and Matabiau railway station. Toulouse Blagnac Airport (TLS) is 10 kilometres away. Built in the early 1900s, the low-rise Grand Hotel Raymond IV is set in a peaceful area. Staff at the 24-hour front desk can help with sightseeing tours to local attractions, and there is complimentary wireless Internet access throughout the hotel. Onsite parking is available (surcharge). There is a bar and conference room. The Mercure Toulouse Saint Georges is a modern hotel, built in 1972 and located in the city centre, 100 metres from the Saint Rome pedestrianised shopping area. The 148 guestrooms over seven floors feature light pastel decor and traditional furnishings. All are equipped with satellite television with pay movies, high-speed wireless Internet connections, direct-dial phones with voicemail, minibars and complimentary newspapers. Bathrooms include shower/tub combinations. The Les Cepages restaurant serves regional fare in a light, brasserie-style room with traditional furnishings. The hotel features a terrace on the first floor, offering views across the street, and complimentary newspapers are available in the lobby. Tours is a city in central France, the capital of the Indre-et-Loire department. It is located on the lower reaches of the river Loire, between Orléans and the Atlantic coast. Touraine, the region around Tours, is known for its wines, the alleged perfection (as perceived by some speakers) of its local spoken French, and for the famous Battle of Tours in 732. It is also the site of the cycling race Paris-Tours. Tours is the largest city in the Centre region of France, although it is not the regional capital, which resides in its second-largest city of Orléans. In 2006, the city itself had 142,000 inhabitants and the metropolitan area had 306,974. 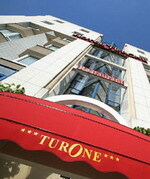 The Hotel Turone is a modern white hotel situated in the centre of Tours, 500 metres from the old town and the railway station, and eight kilometres from the airport. The 120 air-conditioned guestrooms have modern decor and furnishings in soft colours. All rooms include cable television, direct-dial phones, complimentary Internet connections, and minibars. Bathroom have bathtubs and hair dryers. At Le Bistrot des Turons traditional French dishes are available from an à la carte menu, served in a bistro- style setting with white linen tablecloths. Before or after dinner, guests can enjoy an aperitif in the bar, or take advantage of room service. The hotel has a gift shop where souvenirs are on sale, and guests have complimentary use of facilities at a nearby fitness centre. 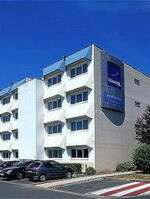 Novotel Tours Sud is located just outside Tours, France, five kilometres from a cinema, seven kilometres from Tours town centre, and 15 kilometres from a golf course. This modern hotel has an outdoor pool, and there are eight meeting rooms on site. Novotel Tours Sud's Cote Jardin restaurant serves French dishes for lunch and dinner. There is both an indoor and an outdoor playground for children. The hotel's 127 guestrooms all come equipped with satellite television, wireless Internet, telephone, climate control, and minibars.